The third day of our trip filled with lots of sight seeing and a bit of driving. In order to do the glacier adventure and see the skywalk, we had to go to The Columbia Icefield Glacier Discovery Centre which is located in Jasper National Park. It took us about 2.5 hours drive from Banff downtown and this time was my turn to drive. The road leading to the Discovery Centre is actually inside the Banff National Park which later will turn into Jasper National Park. Before entering the park, we had to pay for entrance fee. The cashier asked us about our destination, where do we stay for the night, and how long we would be in the park. The one-day pass (good until 4pm the next day) for group (2-7 people) and a vehicle is Cad$19.60. Not bad… Along the way, there were so many beautiful mountainous sceneries as well as gorgeous lakes. 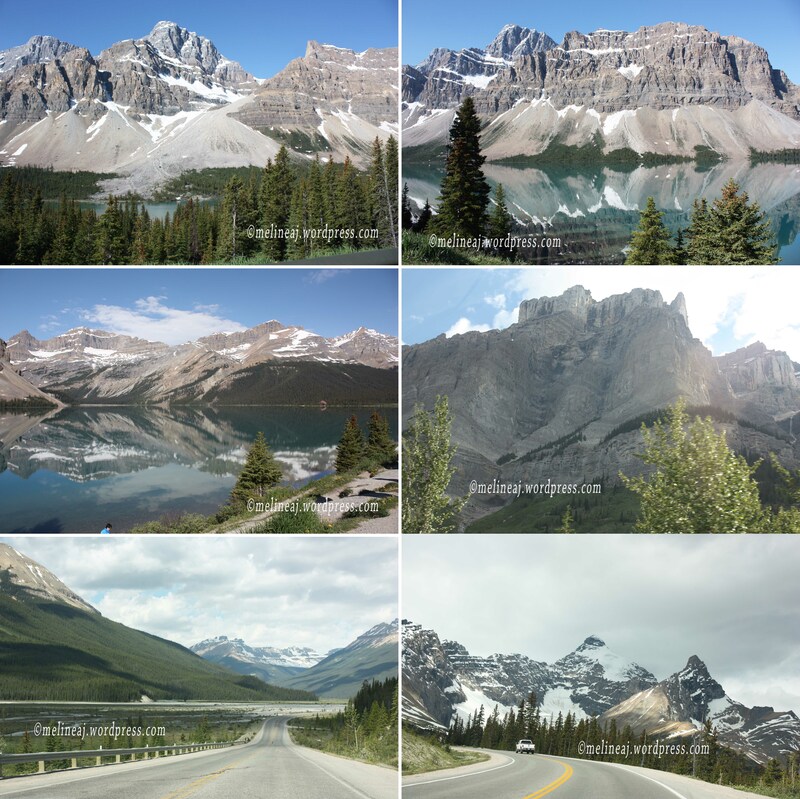 If you have time, you can stop at one of the following: Herbert Lake, Hector Lake, Mosquito Creek, Helen Lake, Crowfoot Glacier, Bow Lake, Bow Glacier, Peyto Lake, Waterfowl Lake, Glacier Lake, Nigel Lake, and Parker Ridge. From my research, Peyto Lake is very beautiful. We actually turned into the small road toward the lake on our way back to Banff. However, we decided not walk down to the lake since it would be a small hike and we were super tired from the tour. We did stop at 2 of the lakes – I forgot which ones – where there were designated viewing areas. Looking at the gorgeous turquoise lake with snowy mountain at the background was just breath taking! It was also an interesting drive in this area. The shape of the mountains differs from one to another as if it has its own character. Some are very pointy, some have flat top, and some are covered with patchy snow looking like a dalmatian or an orca. We finally arrived at the Discovery Centre. There is a spacious parking lot on the west side of the centre. We immediately went to the ticket booth to redeem our real ticket for both glacier adventure and the skywalk. Luckily, we didn’t have to wait long for the glacier adventure. As soon as we got our ticket, we lined up for the shuttle bus. I was a bit shocked since I thought that we were going to ride the big bus with the huge wheels up to the mountain. It turns out that the shuttle bus took us to the Ice Explorer station at the foot of the mountain. *I was super excited!!! * The Ice Explorer bus moved pretty slow – well, it’s better to be safe than sorry when driving on icy path, right?! At one point, the driver warned us that we were about to going down a very steep hill. As you can see in my picture below, we were almost 45° downward angle relative to the ground! It was like riding a super slow roller coaster hahaha…. Once we passed the steep hill, there was a pool of water before we continued to the icy path. The driver said that the water pool is used to wash the Ice Explorer’s wheels so that the bus won’t slip.